Having trouble finding the mouse cursor on your screen? You might want to enlarge it or change its shape. Like many other customizable features, you can change the cursor to suit your eyesight or preference. 1From the Control Panel, choose Ease of Access and then click Change How Your Mouse Works. In the resulting Make the Mouse Easier to Use dialog box, click the Mouse Settings link. 2In the resulting Mouse Properties dialog box, on the Pointers tab, click to select a pointer, such as Normal Select, and then click the Browse button. This dialog box may have slightly different tabs depending on your mouse model features. 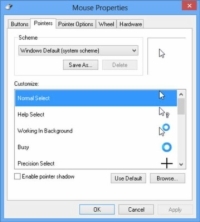 In the Browse dialog box that appears, click an alternate cursor and then click Open. 3Click Apply to use the new pointer setting and then click the Close button to close the Mouse Properties dialog box. Be careful not to change the cursor to another standard cursor. This could prove slightly confusing for you and completely baffling to anybody else who works on your laptop. If you make a choice and decide it was a mistake, click the Use Default button on the Pointers tab in the Mouse Properties dialog box to return a selected cursor to its default choice. You can also choose the color and size of mouse pointers in the Make the Mouse Easier to Use dialog box. 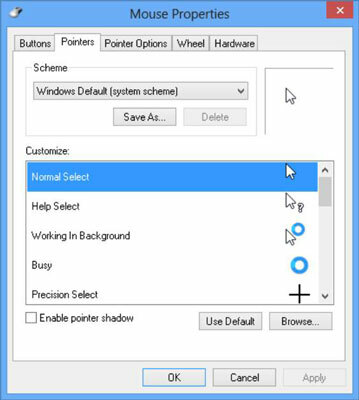 A large white or extra large black cursor might be more visible to you, depending on the color scheme you’ve applied to Windows 8.1.